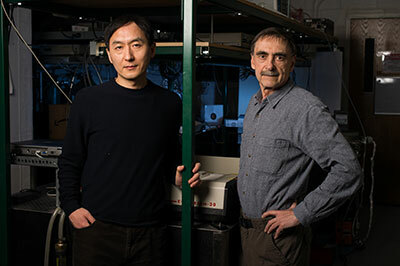 Chunlei Guo, professor of optics, and senior scientist Anatoliy Vorobyev, have received the 2017 T.C. Graham Prize from the Association for Iron and Steel Technology for their use of femtosecond laser pulses to etch metal surfaces. This creates surfaces that are super water repellent, for example, or that absorb light rather than reflecting it. “Dr. Guo and his colleagues have opened the door to an exciting technique that could greatly enhance steel’s value proposition,” says AIST executive director Ronald Ashburn.